Sometime after making the TDC or EMD payment using the Netbanking, Debit Card, Credit Card etc. amount deducted from the bank account or credit card account but due to communication failure from the bank payments not become successful. 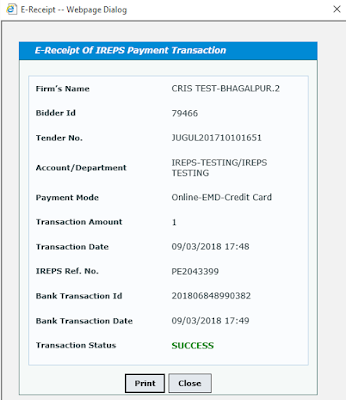 In this case, IREPS provides a Retry button to their users to re-confirm the status of the payment from the payment gateway. 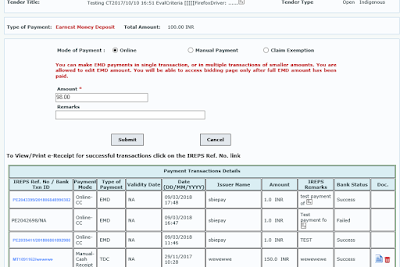 You will not be able to make a new payment if any transaction will be in pending state and you will get the message: Previous transaction is still pending (Please see Payment Transaction Details below). Please click on Retry button for confirmation from the bank. Retry button will work only after 7 minutes from initiating the transaction. 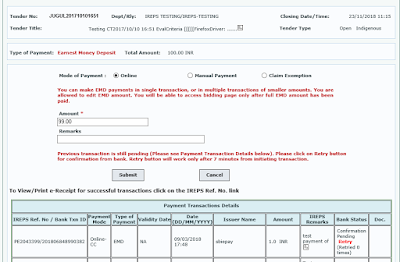 After clinking on Retry button payment status will be Sucess or Failed or it will show the no. of retry attempts. You can initiate a new payment after three Retry attempts or when payment status becomes failed. Go to Live tenders available on your homepage under My Tenders. 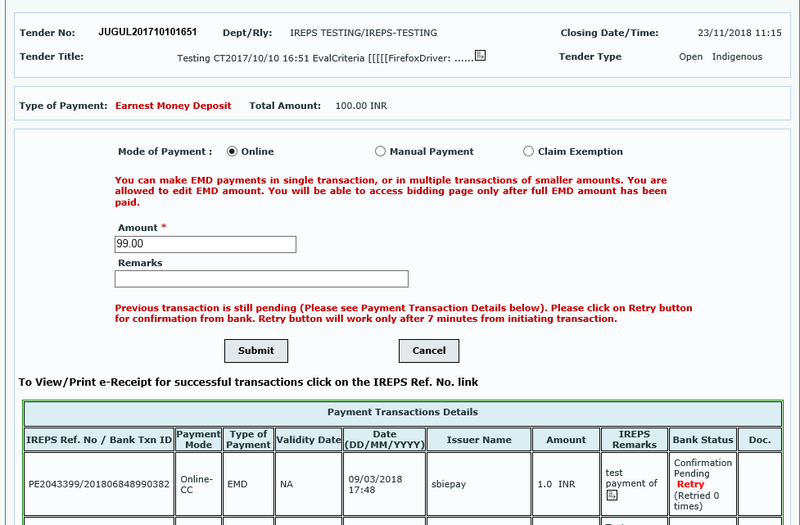 Identify the tender and click on the Submit Payment Details icon. It will show you the list of all payments made by you for this tender. 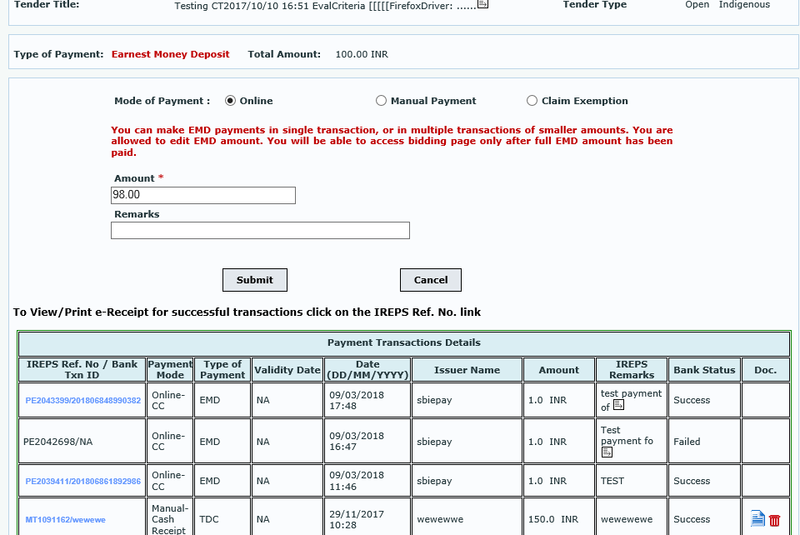 If any transaction is pending then you will get a flashing message "Previous transaction is still pending (Please see Payment Transaction Details below). Please click on Retry button for confirmation from bank." and a Retry button against that payment. Retry button will work only after 7 minutes of initiating the transaction, if you will click on it before 7 minutes then you get the alert message "Unable to verify this transaction currently. The failure may be either because you have attempted retry before 7 minutes from initiating transaction, or due to any other technical reason. Please try later. Please contact helpdesk if problem persists"
After 7 minutes click on retry button and your payment will be successful or failed. In my case, it becomes successful in first Retry attempt. 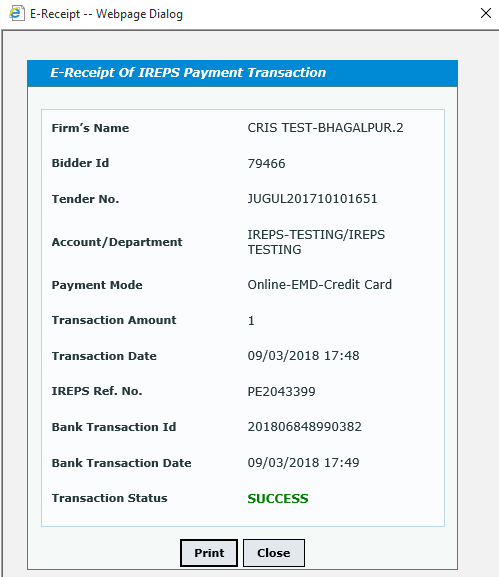 When Bank Status for the payment becomes Success then payment receipt will be generated which you can see by clicking on the IREPS Ref. No. / Bank Txn ID. There may some issue on SBIePay end.